Pinpointe Marketing is a full service consultancy that specializes in the sales and marketing of highly engineered industrial products. We don't attempt to be all things to all people. Our sweet spot is working with companies that make highly engineered products in the complex sales space. This is what we're good at. It is where we can add some real value. 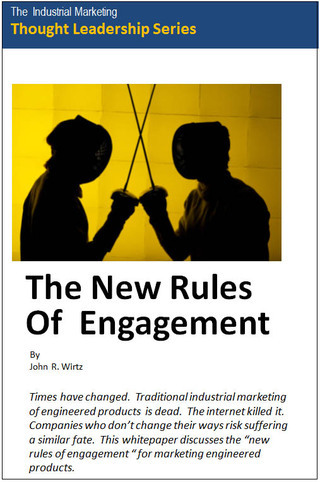 We are especially good at helping industrial manufacturing companies understand and adapt to the "new rules of engagement" for selling engineered products. The traditional way of selling these products is dead. The internet killed it. It used to be that the selling process for industrial products, which is known as outbound marketing, began with a call to your sales people... because it was the easiest and sometimes the only way for a buyer to get the information they needed to begin the purchasing process. This is no longer the case. Outbound vs. Inbound Marketing Traditionally, most industrial marketing was "outbound-marketing" that focused on creating awareness among prospective customers. Information was shot-gunned out and prospects that expressed an interest were placed into the sales funnel for follow up by the sales team. Prior to the internet, this approach worked pretty well because the customer needed to talk with a salesperson to get the information they needed to get a quote or solve their problems. This is no longer the case. Today, a prospect can search the internet, read blogs, subscribe to RSS feeds, scour industry forums, attend webinars, participate in virtual tradeshows, download whitepapers and review technical specifications without speaking to a salesperson or even leaving their desk. Today, the name of the game is Inbound Marketing...marketing that pulls prospects into your sales pipeline by providing educational material and information that is all about them not you. By helping them solve their problems, you become a trusted source and partner...not just a supplier. So it only stands to reason that the next time they have a project to source, you will have a much better chance of being on their short list.